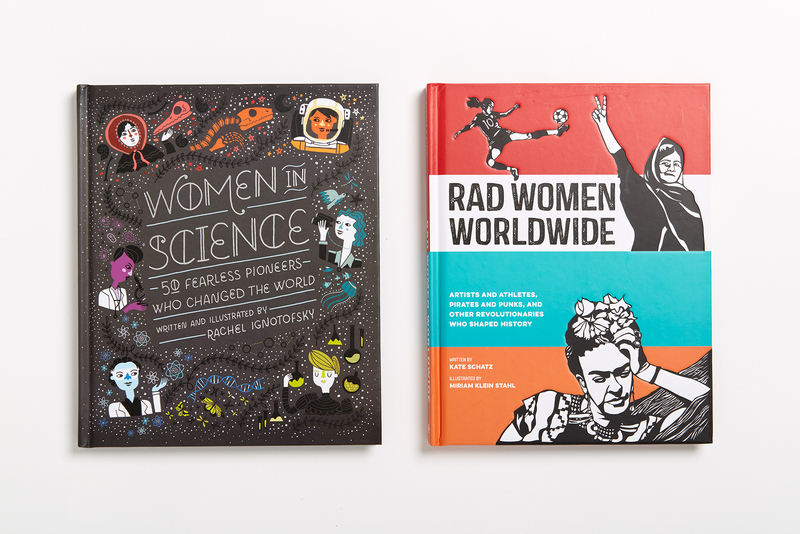 A charming and illustrated gift book profiling 50 famous women in science, technology, mathematics, and engineering (STEM). Nothing says trouble like a woman in pants. That was the attitude in the 1930s, anyway; when Barbara McClintock wore slacks at the University of Missouri, it was considered scandalous. Even worse, she was feisty, direct, incredibly smart, and twice as sharp as most of her male colleagues. She did things her way to get the best results, even if it meant working late with her students, who were breaking curfew. If you think these seem like good qualities for scientist, then you are right. But back then, these weren’t necessarily considered good qualities in a woman. Her intelligence, her self-confidence, her willingness to break rules, and of course her pants were all considered shocking! Barbara had already made her mark on the field of genetics with her groundbreaking work at Cornell University, mapping chromosomes using corn. This work is still important in scientific history. Yet while working at the University of Missouri Barbara was seen as bold and unladylike. The faculty excluded her from meetings and gave her little support with her research. When she found out they would fire her if she got married and there was no possibility of promotion, she decided she had had enough. Risking her entire career, she packed her bags. With no plan, except an unwillingness to compromise her worth, Barbara went off to find her dream job. This decision would allow her to joyously research all day and eventually make the discovery of jumping genes. This discovery would win her a Nobel Prize and forever change how we view genetics. Barbara McClintock’s story is not unique. As long as humanity has asked questions about our world, men and women have looked to the stars, under rocks, and through microscopes to find the answers. Although both men and women have the same thirst for knowledge, women have not always been given the same opportunities to explore the answers. In the past, restrictions on women’s access to education was not uncommon. Women were often not allowed to publish scientific papers. Women were expected to grow up to exclusively become good wives and mothers while their husbands provided for them. Many people thought women were just not as smart as men. The women in this book had to fight these stereotypes to have the careers they wanted. They broke rules, published under pseudonyms, and worked for the love of learning alone. When others doubted their abilities, they had to believe in themselves. When women finally began gaining wider access to higher education, there was usually a catch. Often they would be given no space to work, no funding, and no recognition. Not allowed to enter the university building because of her gender, Lise Meitner did her radiochemistry experiments in a dank basement. Without funding for a lab, physicist and chemist Marie Curie handled dangerous radioactive elements in a tiny, dusty shed. After making one of the most important discoveries in the history of astronomy, Cecilia Payne-Gaposchkin still got little recognition, and for decades her gender limited her to work as a technical assistant. Creativity, persistence, and a love of discovery were the greatest tools these women had. Marie Curie is now a household name, but throughout history there have been many other great and important women in the fields of science, technology, engineering, and mathematics (STEM). Many did not receive the recognition they deserved at the time and were forgotten. When thinking of physics, we should name not only Albert Einstein but also the genius mathematician Emmy Noether. We should all know that it was Rosalind Franklin who discovered the double helix structure of DNA, not James Watson and Francis Crick. While admiring the advances in computer technology, let us remember not only Steve Jobs or Bill Gates, but also Grace Hopper, the creator of modern programming. Copyright © 2016 by Rachel Ignotofsky. All rights reserved. No part of this excerpt may be reproduced or reprinted without permission in writing from the publisher. – Mary Roach, author of Gulp, for Google Play's "Our Favorite Authors’ Favorite Books of 2016"
"This charming encyclopedia includes a page of text and a fanciful drawing of the women scientists you’ve heard of — and plenty who you haven’t! The book has good coverage of the 1800s and early 1900s — a critical time when women’s expanding participation in science was changing the very structure of how knowledge is pursued. 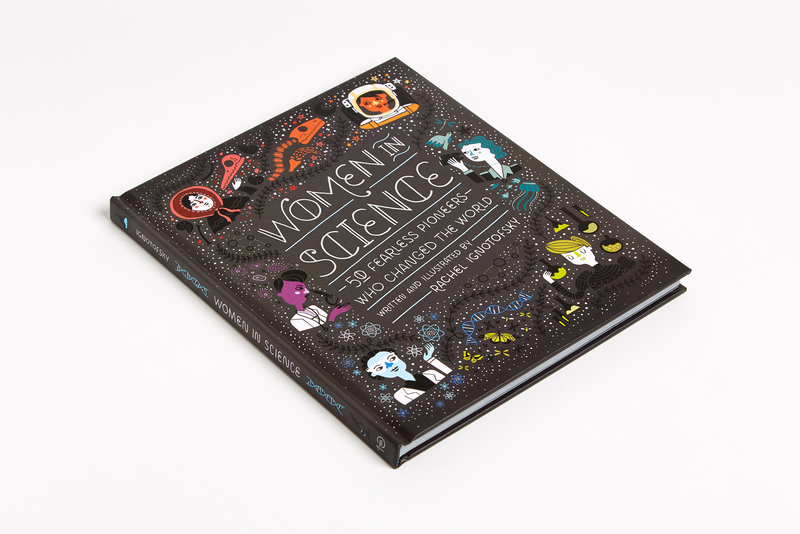 Interspersed with gems like a colorful timeline of women’s achievements, and a cartoon celebrating a wonderful hoard of lab supplies, Ignotofsky’s profiles of diverse female scientists is a great addition to the shelf of any student, of any age." "With short, inspiring stories and the accessibility of a graphic novel. . .the perfect book to share with the science- and tech-minded people (male and female, young and old) in your life. . . .The must-read, girl-power STEM book." 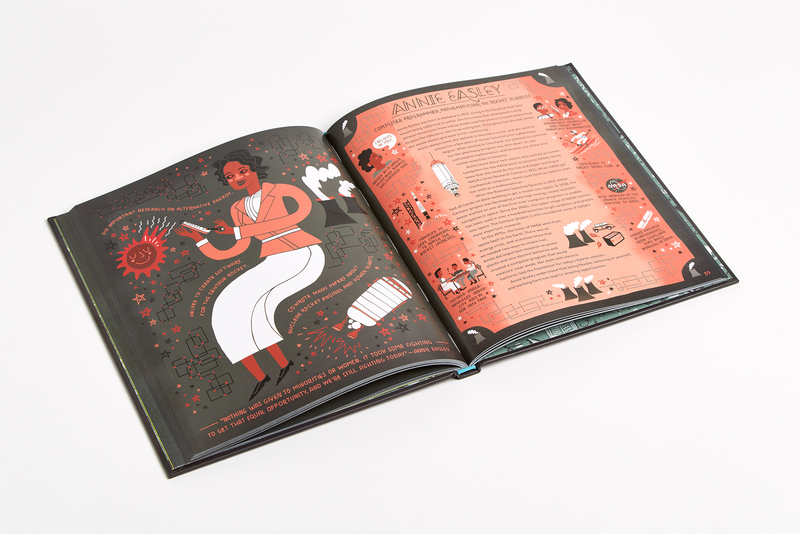 "This book of illustrated biographies of scientific pioneers is hands-down gorgeous. 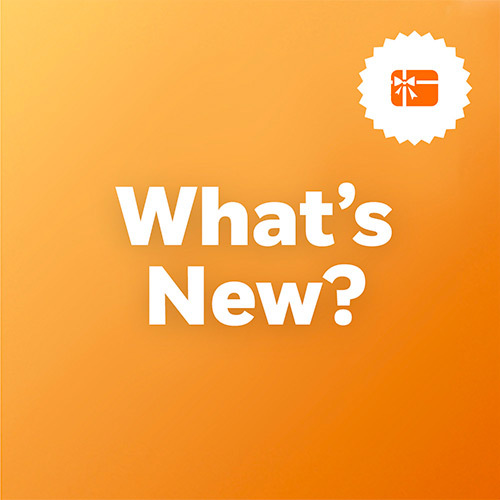 . . .Kids will love paging through this, looking at all the detailed drawings, but they'll likely have to rip it out of the hands of the adults who are marveling at each new page of factoids." "I applaud Ignotofsky and her publisher for telling these important stories about women through such a rich, visual medium. The world needs more books like this." 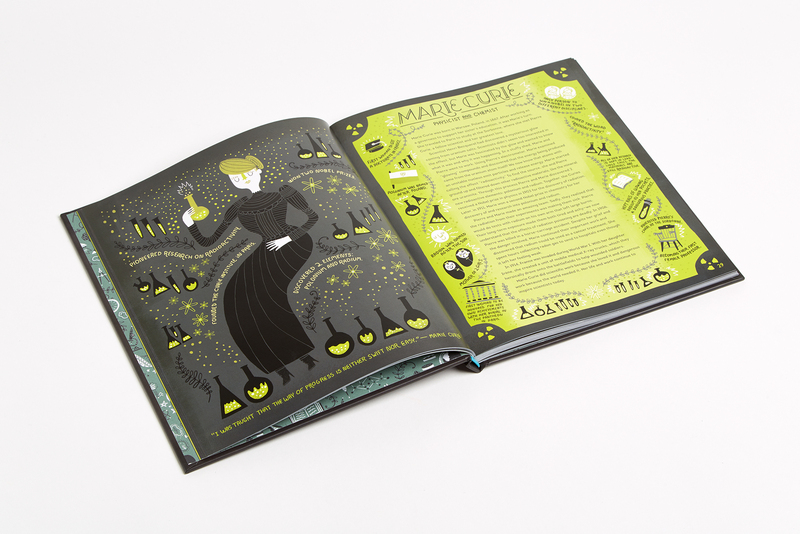 ". . .an illustrated homage to some of the most influential and inspiring women in STEM. . . .Ignotofsky captures the heartbreaking inequalities that only amplify the impressiveness of these women’s feats." ". . .a clever introduction to women scientists through history." "True fact: This book is so cool that I had to go steal it back from my fifth grade daughter to review it. . . .this book perfectly balances well-researched facts with gorgeous, whimsical illustrations making it a favorite you just can’t put down." RACHEL IGNOTOFSKY is a New York Times-bestselling author, illustrator, designer. She graduated from Tyler School of Art's graphic design program and formerly worked as a senior designer and illustrator at Hallmark Greetings. Rachel and her work have been featured in many print and online media outlets such as Babble, the Huffington Post, Scientific American, and Buzzfeed. She is the author of The Wondrous Workings of Planet Earth, Women in Science, Women in Sports, and I Love Science.